The Pilot Pen people have developed a great magnetic drawing board called CleanWriter. 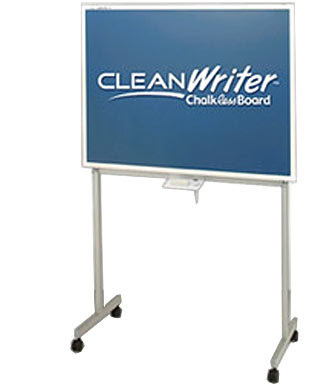 It comes in sizes up to 48" by 36" and was developed for industrial "clean room" environments and hospitals so it is not messy, and as a bonus, the CleanWriter is much more durable than the familiar magnetic writing boards you might buy at the toy store. It would make a perfect replacement for chalkboards or erasable marker boards. Unfortunately, Pilot corporate headquarters in Japan is thinking of discontinuing the CleanWriter at the end of this year because the sales volume is low, so if you have a project that could use this technology, contact Pilot now! Check out the CleanWriter webpage (with product demo video) for more information. They stopped manufacturing, yes? Have you heard of an alternative? Yes it seems like there wasn't enough demand to continue sales. I'll keep folks posted if I find an good alternative.